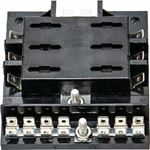 Size 3.9" x 1.9" x 2.1"
Size 5.8" x 1.9" x 2.4"
Includes contour lock system which allows you to module as many fuse holders as you like together. Link inputs together or split them apart to allow multiple power groups within one fuse holder. Includes a clip on cover with label positions. Max. amp. per circuit-30, Max. amp per block-100, Max volts-32VDC.